Screws included. 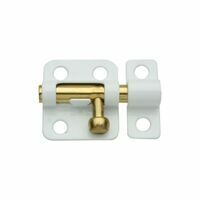 National Hardware Window Bolt, Series: V833, 0.31 in Bolt Diameter, 2 in Bolt Length, Steel, White, BHMA A138.18, For Security Applications Such as on Windows, Cabinets, Chests and Doors Designed for security applications on lightweight doors, chests and cabinets. Use on vertical, horizontal, left or right hand applications. In vertical use, the notch-in case holds the bolt in a locked position. Bolt diameter is .32, durable steel case, strike and bolt. Visual-pack. Designed for security applications on lightweight doors, chests and cabinets. Use on vertical, horizontal, left or right hand applications. In vertical use, the notch-in case holds the bolt in a locked position. Bolt diameter is .32, durable steel case, strike and bolt. Visual-pack. Designed for security applications on lightweight doors, chests and cabinets. Use on vertical, horizontal, left or right hand applications. In vertical use, the notch-in case holds the bolt in a locked position. Bolt diameter is .32, durable steel case, strike and bolt. Visual-pack.